Mediterranean gypsy jazz, Django Reinhardt style. Born in Badalona (Catalonia, Spain) the 20 of november of 1958. Guitar player, composer, arranger, music producer. Self - taught musician. He has demonstrated a tremendous interest in all musical genres, starting in the world of Rock and Blues and moving to Jazz. He has excelled in several groups and as a solo artist, and he has made several recordings and performed in concerts and festivals in the United States, Mexico and Europe. In 1992 his first Compact-disc, “Metanoic”, published in Holland with the Pere Soto and Bill Gerhardt Quartet, was selected by Jazz South Federation (USA), best CD of the month and broadcoasted all over the United States. Bill Gerhardt, Dave Douglas, Dave Liebman, Ben Allison and Jeff Ballard. In 2000 his String Quartet nº 2 is performed by “ EL cuarteto de la ciudad de México”, in Mexico City. In 2004 he has played in Spain, Holland, England, México, and completed a three month long tour USA-MEXICO (WaterTown, New York, Ashville, Charlotte, North Carolina, Greenville, South Carolina, Austin, Texas, Pórtland, Oregon, San Miguel de Allende and Queretano (México). since 1984, he is leading the Catalan International gypsy jazz band “Django's Castle” (www.chetman.com/django'scastle). The band has been release 4 Cds: Nuages 2001, Prisoners of Love 2002, El caliqueño del Califa 2004 and Blue Drag 2004. 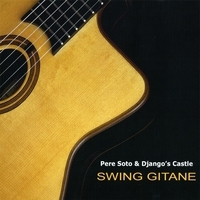 Also his song Menor-k blues from Prisoners of Love appears on the last recopilation Cd from Hot Club Records, Norway, Django Festival 3- gypsy Swing today 2004 with big gypsy names like Jimmy Rosenberg, Angelo Debarre, John larsen, Walter Malosetti, etc.